Snapshot of what it looks like under the cockpit sole. The dark underbelly of an Alberg 35 below the cockpit is no place for humans of any size, let alone someone who happens to be 6'5". 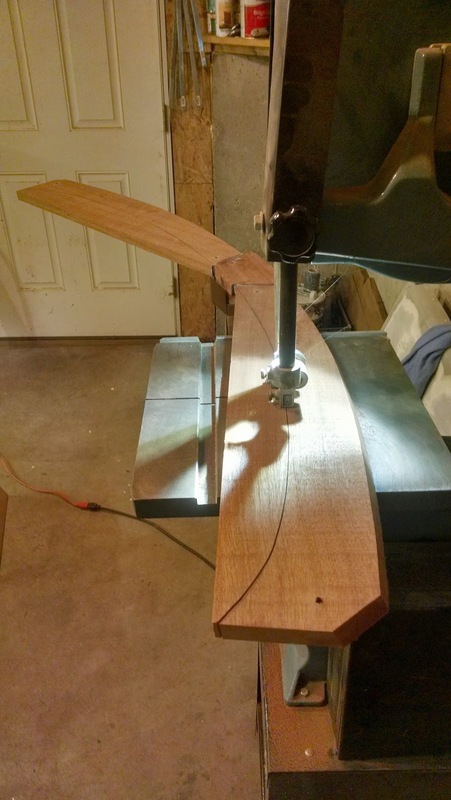 My helpers (kids) were away this weekend so I couldn't finish bolting on the rubstrake because I need someone to hold one end, so I turned my attention to the cockpit and how I am going to drop the rudder. 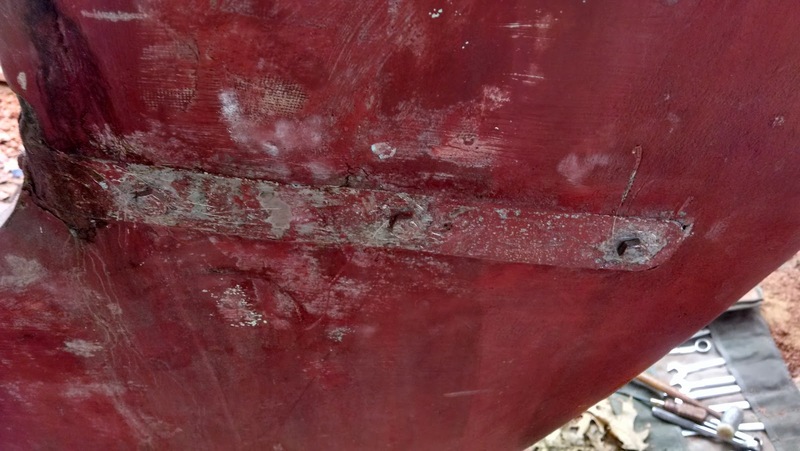 I started under the boat and began chipping away many years of bottom paint from the rudder fasteners. To my surprise, once I scraped all the junk off, there were clean shiny bolts underneath that were actually serviceable.... amazing. 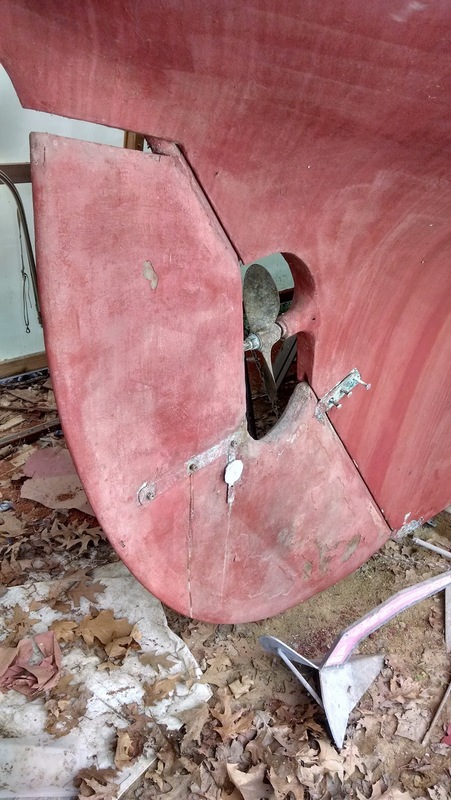 The rudder post is actually 2 pieces, the upper part goes up into the boat is 1.5" stainless and the lower end that terminates in the rudder shoe is 1.5" bronze. There is one bronze strap located at the top of the lower post and keeps the rudder from riding up and out of the shoe. This gave me the most trouble but considering it's age, it wasn't bad at all. The strap is pretty badly corroded and will need to be replaced, but I it came off easily enough. Once that was off there was nothing else on the outside that needed to be taken off to free the rudder other than lifting it off the shoe, which meant it was time to go into the dreaded 'under the cockpit hell'. The slender lines of the Alberg when you see her sitting at anchor or sailing along make for some of the most diabolical access under the cockpit which is where a good chunk of the important stuff lives. My particular Alberg is further compounded by modifications by a previous owner that make access to the rudder from the engine/quarterberth area nearly impossible. So basically I have 2 options, the aft lazarette is a good place to see (upside down) the work that needs to be done but none can be done from there because it is too far away from the rudder post to reach anything. The other option is the cockpit lazarettes. These are the only workable solution to actually accessing the rudder. Of course if you are somebody who is 4'10" and works as a contortionist at the carnival, this might be a decent place to practice your craft, but for someone like me it is mainly suited for torture. Anyway, given all my complaining things were actually going well. 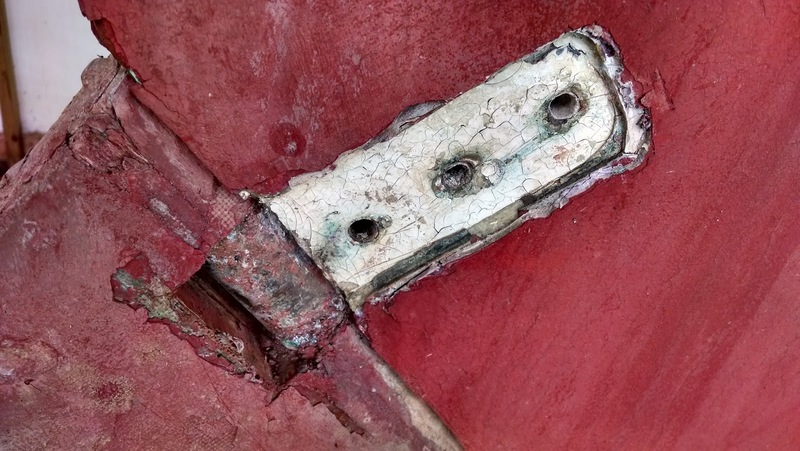 I expected a corroded mess but was able to unbolt the quadrant from the rudder shaft with little difficulty. It still took close to 45 minutes because I had to keep coming up for air in the locker, but the bolts were completely free of corrosion. Once the quadrant was free, I moved onto the wire rope sheave assemblies. The port sheave was also corrosion free and didn't require me to reach too deep into my bag of profanity. The starboard one was another matter. The first 2 bolts came out fine, but the forward 2 were completely inaccessible. I suspect they were installed when the previous owner's modifications were made. 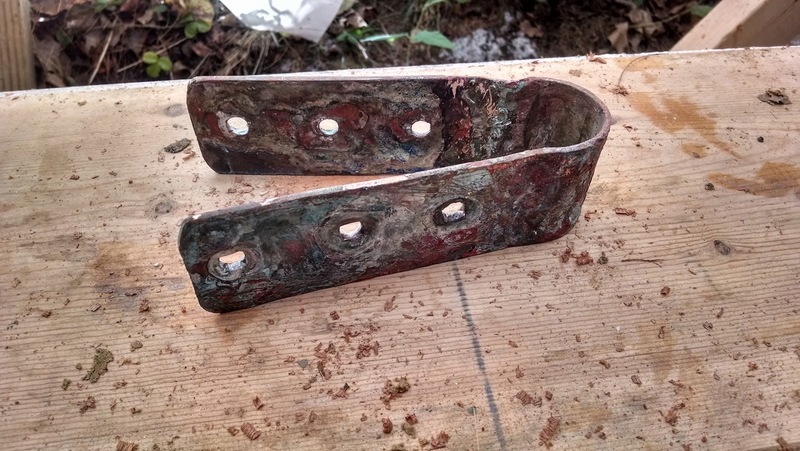 My theory was reinforced when I finally found the last 2 bolts; they were encased (with fiberglass) in a bulkhead that made up the aft end of the quarterberth. Unfortunately for me, this meant that if I really wanted to remove the sheave (I did), then I would have to cut the bulkhead. To make a long story short, I ended up using a drill to cut out a small (1"x 1") piece of the bulkhead where each bolt was located and then get an open ended wrench in to slowly turn the nuts off. It took a ridiculously long amount of time and the only saving grace is that I was able to extract the sheave without any damage and will be able to sell it and the other bronze jeweler I dug out to help bolster the boat fund (Stuff for Sale). Well, August was pretty much a bust for boat work. Vacation, kids, house projects, and boat shed heat all conspired to keep me away from the boat. Now that temps are starting to drop though, it's time to get a few things glued up before it gets too cold. With any luck I should have the rail and part of the cockpit done before winter. 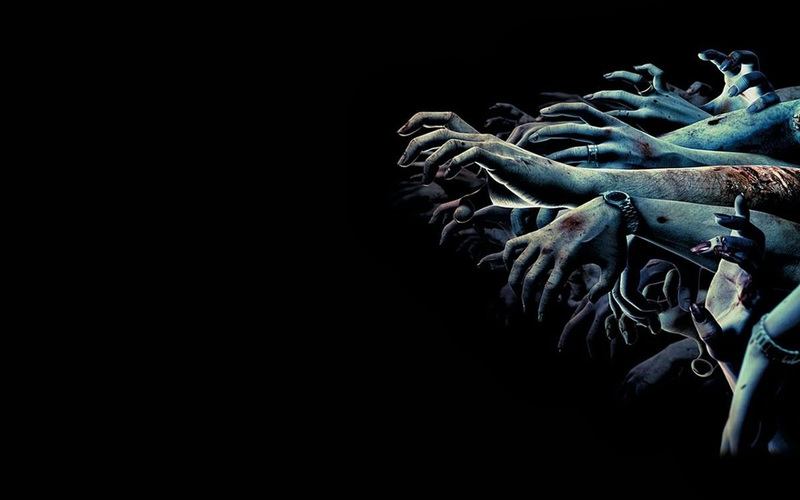 While not much has been done, I haven't been completely idle. I tapped all the screw holes for both rails (every 8") and routed the inside edge with a roundover bit to give a 3/8 inch radius. I had my wife and kids help me take both rails off the bulwark and cleaned up the underside and sanded the lower bottom inboard edge so nobody sliced their toes when walking on deck. Finally, using Sika-Flex 291, I layed down a bunch of goop on the bulwark (I forgot to take a picture), and layed the rails back on with the help of the family. It's definitely a multi-person job trying to lay down 36' of caprail onto a pile of sticky goo without making a huge mess. All went well though and once they were seated, I screwed both sides down tight. They are not going anywhere. I also started working on the stern caprail over the past few weeks. This has been something of an enigma to me, because I just really wasn't sure how I was going to do it without it looking really crappy. In fact even after I had made the initial board cuts, I wasn't sure if it was going to work. 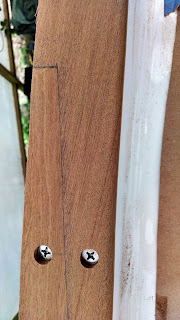 Originally, I had planned on using a single piece to span the whole stern, but a miscalculation on my part left me without a piece of Sapelle long and wide enough to fit. I do have more Sapelle stock, but I am planning on using those boards for the cockpit coamings and rubstrake. 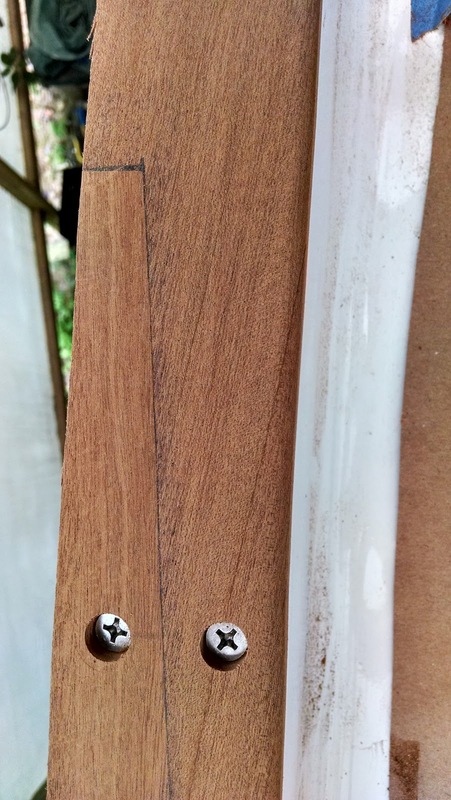 I guess I'm cheap, but I couldn't justify spending another $100+ on a small section where more than 50% is waste when I already had several smaller pieces that could be glued up to accommodate the job. 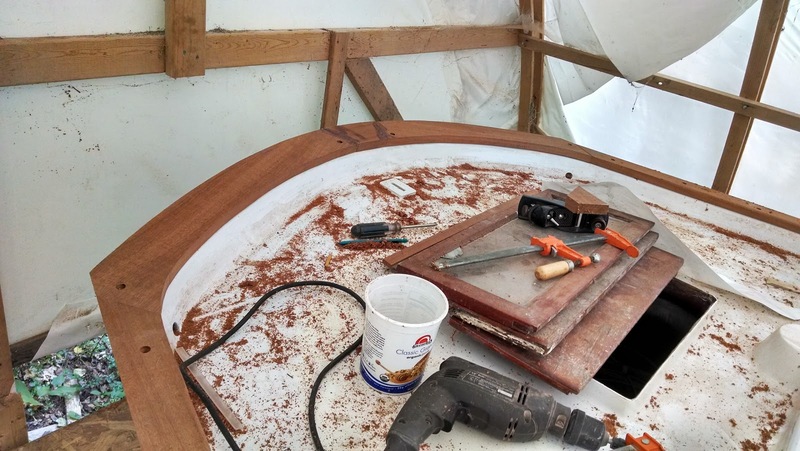 Figuring the proper cuts for this section really gave me new found respect for wooden boat builders. 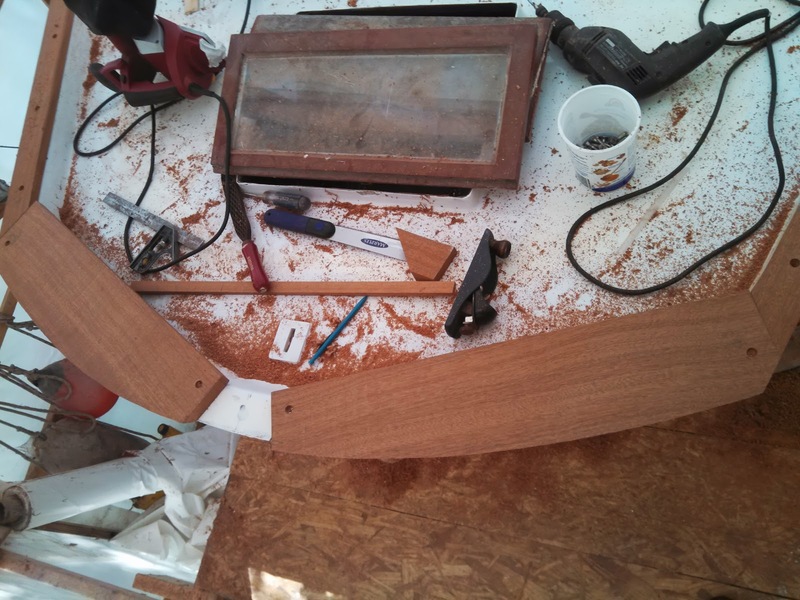 Not only are you challenged with figuring the cuts for a curved piece that has different radius's on each side, but you have a third dimension (the camber of the bulwark) that requires you to bend the board as well. Anyway, to get the job done, I decided to use 2 long pieces and a third, small piece like a keystone. This solved 2 problems for me. The first as I already mentioned was that I could use existing scraps and not destroy one of my longer boards and second: my carpentry skills are decent, but doing it this way made the board length calculations based on the deck camber radius moot, so I didn't have to worry about the length of the two long boards, I could just cut the 'keystone' piece to whatever length the other 2 boards didn't (I think I am making it sound more confusing than it was). I cut the 2 longer boards, fitted them to the outside caprail and then screwed them down. There is about a 3/4" radius bend that I had to get, but the boards bent easily into place. Using my power planer, I rough planed down the outside radius. After that, it was just a matter of fitting and cutting the 'keystone'. Once I was happy with the fit, I placed a piece of plastic underneath the middle section and glued the 'keystone' in place. 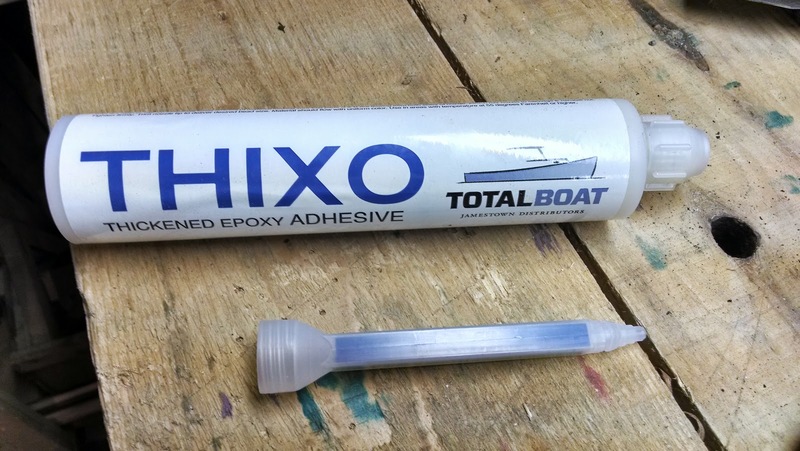 Over the years I have grown weary of mixing up epoxy and adding thickener until I get the right consistency, so lately, I've been using Jamestown Distributors epoxy tubes Thixo for my 'glue'. I think West System came out with it first a few years back and others soon followed. Basically, it comes in a caulking gun size tube and has a mixing chamber in the tip. The 2 parts in the tube mix in the nozzle as you squeeze the trigger and you get a nice consistent flow of mayo like epoxy that is great for small jobs and the tip allows you to be very neat. The downside is that while you can store a half used tube of the stuff, the tips are only good for one use and there is a fair amount of waste in the tip. Fortunately each tube comes with 2 nozzles. I gave it a few days to cure and then scribed the inner bulwark radius onto the boards and pulled the whole thing off and took it back to my shop for a date with the bandsaw. The blade on my 14" Reliant bandsaw has probably seen better days and the guide blocks need to be tuned/replaced so I usually cut proud of the line so the blade doesn't wander into the no-cut area but this time I decided to go for it and cut right to the line and just went ridiculously slow and I'm pretty happy with the result. It will need some sanding and a little cleanup, but overall the cut looks great. 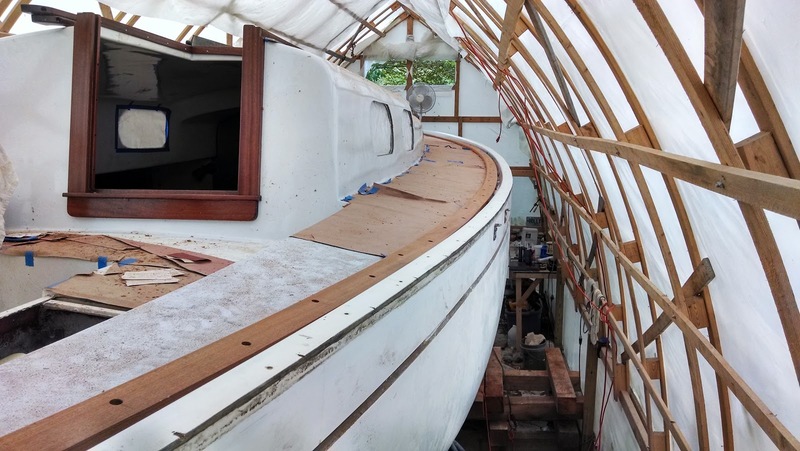 I took it back over to the boat and carefully screwed it back into place for a test fit and I'm happy to say that it looks pretty good. It's not perfect, but it's something I can live with. 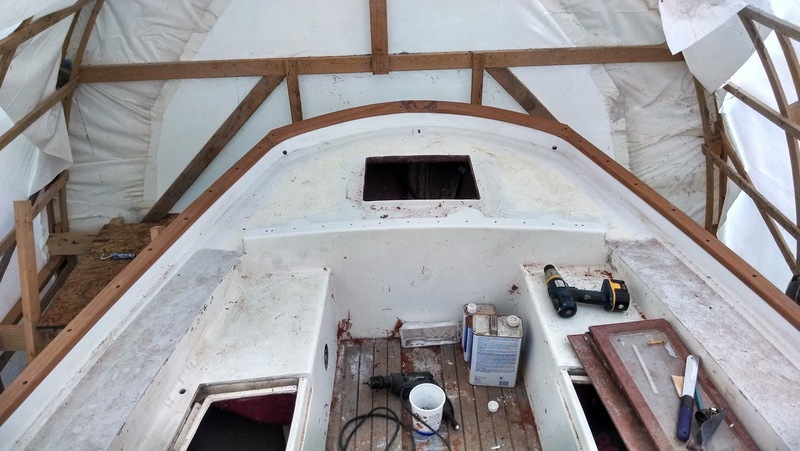 I still have to clean up the epoxy lines on the 'keystone' but other than that and some sanding it's good to go for some Sika-Flex, screws and the roundover bit.